Differential forms are a powerful mathematical technique to help students, researchers, and engineers solve problems in geometry and analysis, and their applications. They both unify and simplify results in concrete settings, and allow them to be clearly and effectively generalized to more abstract settings. Differential Forms has gained high recognition in the mathematical and scientific community as a powerful computational tool in solving research problems and simplifying very abstract problems. 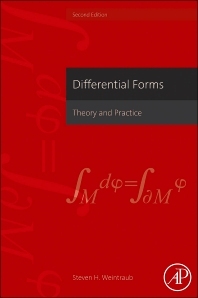 Differential Forms, 2nd Edition, is a solid resource for students and professionals needing a general understanding of the mathematical theory and to be able to apply that theory into practice. Steven H. Weintraub is a Professor of Mathematics at Lehigh University. He received his Ph.D. from Princeton University, spent many years at Louisiana State University, and has been at Lehigh since 2001. He has visited UCLA, Rutgers, Oxford, Yale, Gottingen, Bayreuth, and Hannover. Professor Weintraub is a member of the American Mathematical Society and currently serves as an Associate Secretary of the AMS. He has written more than 50 research papers on a wide variety of mathematical subjects, and ten other books.